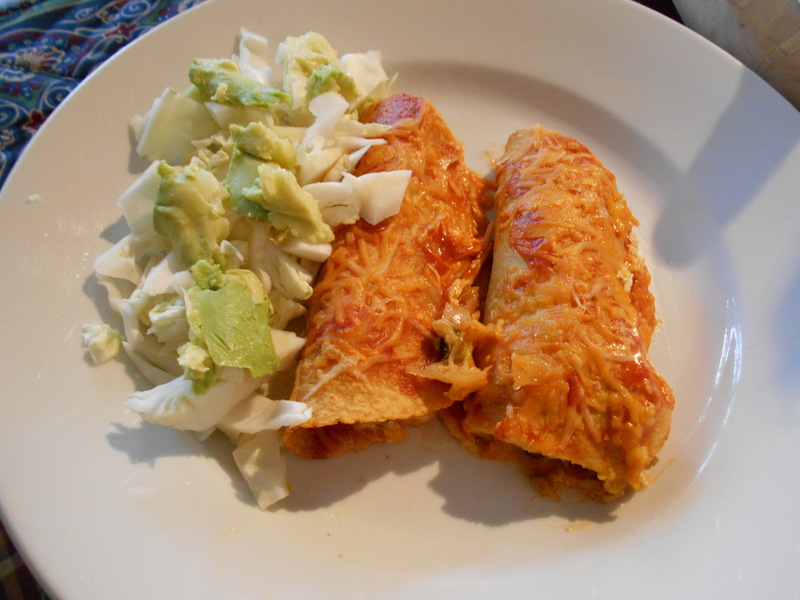 Spread a generous amount of the enchilada sauce on each side of the tortillas before filling them. 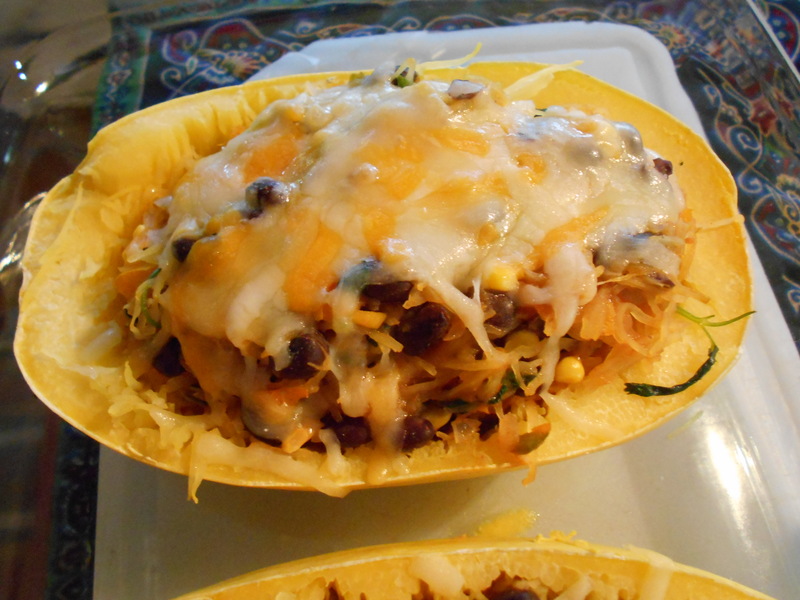 Then, fill each tortilla with the cooked spaghetti squash filling, top with a tsp. 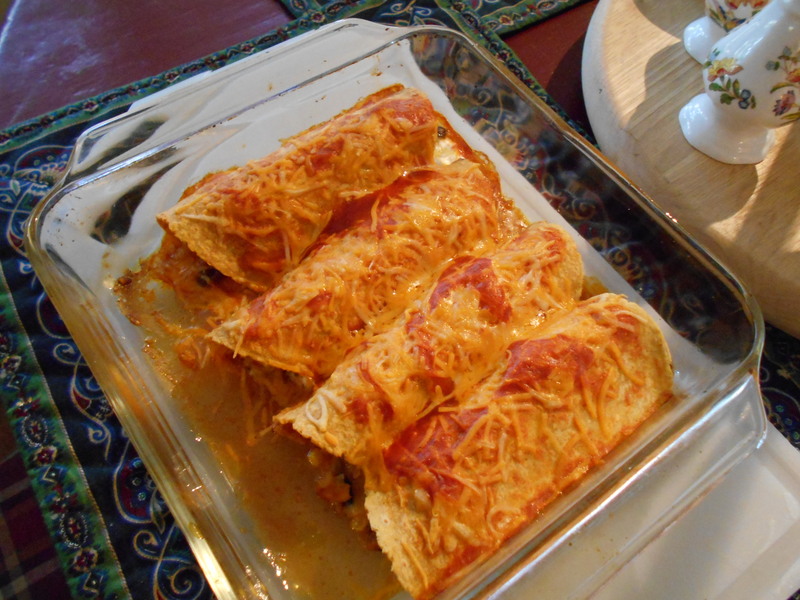 of sour cream, some more cheese, roll carefully and place rolled side down in your dish. Do these with as much filling as you have to fill the tortillas. When your oven proof dish is filled, top the tortillas with more sour cream and cheese. Bake this dish uncovered in the pre-heated oven for at least 30 minutes but NOT till the enchiladas are dried out so watch carefully. 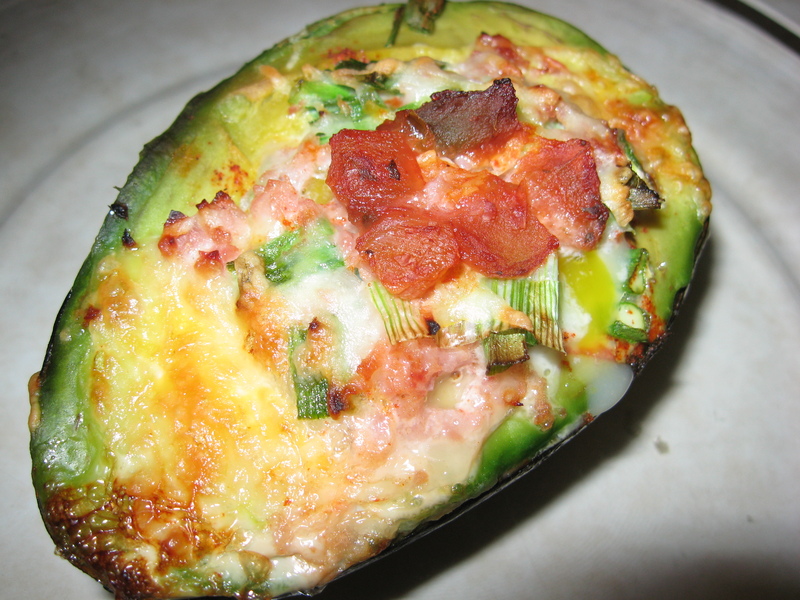 Serve with a side of chopped green cabbage that has been mixed with white wine vinegar and salt (no oil) and topped with some avocado slices. Pre-heat oven to 375. 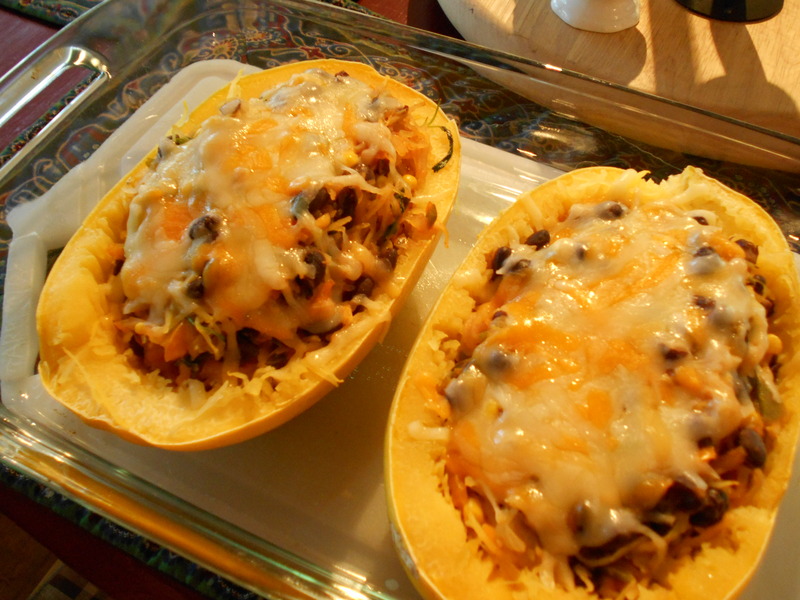 In an oven proof dish, pour 1 C. of water in the dish and place your squash halves, flesh side down, in it. Place the dish in your pre-heated oven for about 35 minutes or until a sharp knife can pierce the skin easily. 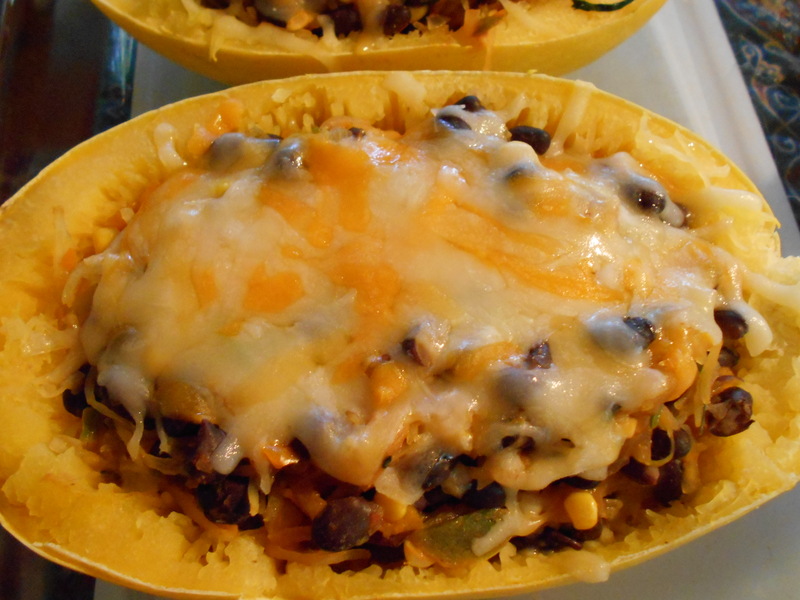 Take out of oven and let the squash cool for a little bit before you rake it with a fork to remove the strands—but careful, leave the shell in tack for the stuffing. Place the squash back in your dish (which now has no water) because you will be placing the stuffing in the squash and back into the oven for a bit. Turn the oven down to 350. Well priced avocados still are bountiful at Atkinsons’. They are a nice large size and delicious tasting so here’s another easy and yummy recipe for anytime really—but of course perfect for breakfast. I serve this with warm tortillas, but a crusty baguette or toasted English muffin would also make a nice accompaniment. Line your desired baking dish that you will be using with aluminum foil. Cut the avocados in half, length wise. If there is not enough of a dip in the avocado to hold an egg, take some of the flesh out so that you’ll have a nice dip. Place the avocados in the dish and place a cracked egg in each. Some of the white may run over, but that’s OK.
Top the avocado and the inserted egg with your options listed in the ingredients. You might think of even more options, such as sour cream, etc. Place the dish in the oven for 20 minutes. You can see if you like the results at 15 minutes, but mine is perfect in 20 minutes. 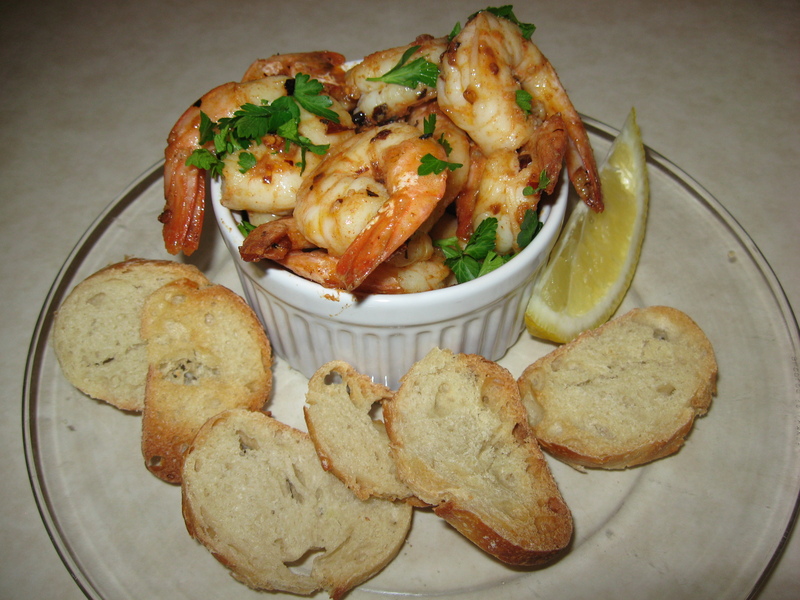 Well, I love shrimp and I love garlic so you know what I think of these simple, delicious and lovely to look at dishes. If you like the two ingredients I just mentioned, don’t wait to create these easy ecstasies; they can suffice as hors d’oeuvres or as a luncheon or supper dish. Easy and good–I aim to please. 1 to 1 ½ Lb. medium shrimp, peeled, deveined and unfrozen (I do not buy the ready to cook type of shrimp because for my taste, the uncooked shrimp is so superior and it’s a breeze to handle). 2 Tblsp. dry sherry (I used white vermouth because I didn’t have dry sherry. White wine would be OK as well. I hear that even white vinegar or rice wine will do but I haven’t tried that for this recipe). In a sauté pan or a large deep skillet, over medium heat, heat the olive oil. Add the garlic and red pepper flakes and sauté until the garlic turns golden (about one minute). Raise the heat to high and add the shrimp, lemon juice, sherry and paprika. Stir well, then sauté, stirring briskly, until the shrimp turn pink and curl slightly (about 3-4 minutes). Season to taste with S&P and sprinkle with parsley. Serve hot over white rice or even Spanish styled rice or sided with sliced crusty French bread. Left-over’s? Place in frig. and reheat slightly in the micro the next day. They’ll still be good. Chop roughly the peel of one orange and add it when you sauté the garlic and red pepper. Substitute the lemon juice with the juice of your one orange. 1 Tsp. of ground cumin can be added to the paprika if you wish or you can delete both of these spices totally. Substitute chopped cilantro for the Italian Parsley. 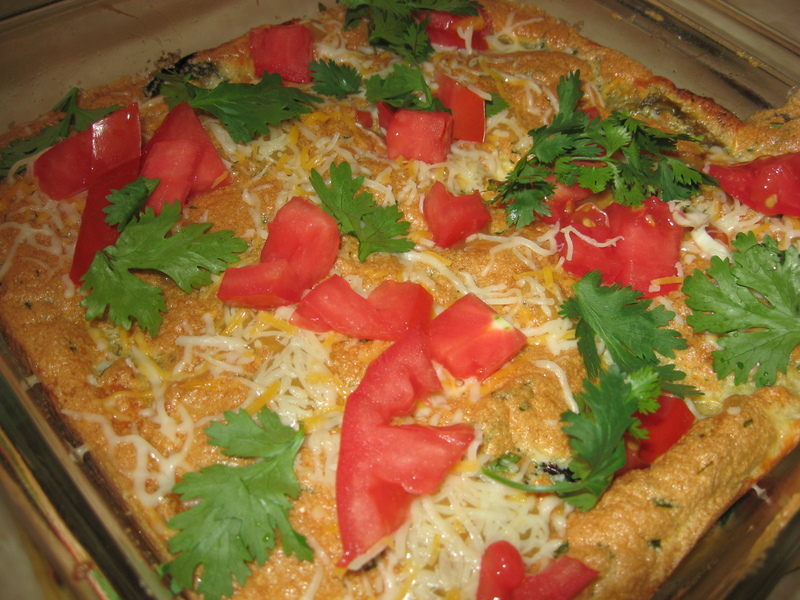 Serve this with warm corn tortillas or over Mexican rice or with sliced crusty French bread. Make sure your pan that you are using stove top will be broiler proof and will fit on the oven rack correctly as near to the broiler as possible. Turn the fan on. Where the directions say to add the shrimp etc., do so but very quickly so as be able to stir everything to blend well—- once again quickly. Cook, shaking the pan once or twice and stirring if necessary, but generally leaving the shrimp undisturbed until they are pink all over and the mixture is bubbly. This may take from 5 to 10 minutes depending on the heat of your broiler. This is such an easy delectable tidbit to make as an accompaniment to a nice fruit dish or even just for a good nibble or as guest appetizers (and maybe even desert?). I served it with a Mexican breakfast consisting of my Mexican Egg Casserole which I served with Peppered Corn Muffins and a beautiful bowl of freshly made Poached Pears with Cinnamon and Fennel. Of course, kids will really go for these and probably you will too. So beware—put them away before you or your family eat them all. Cut the tortillas with a pizza cutter or a serrated knife in 8 long strips. Mix the sugar and cinnamon together. I put this mixture in an empty spice bottle that had a shaker top on it. I actually did not use all of this mixture. Arrange the wedges on a large cookie sheet lined with parchment paper and spray the strips with nonstick cooking spray (I used olive oil spray). Immediately sprinkle the wedges with the sugar/cinnamon mixture—as much or as little as you wish. Bake the wedges in a preheated 375 degree oven for 10-12 minutes or until lightly brown and crisp. Let them sit for a minute or so. If you are not going to use them immediately, place them in a paper bag and seal till ready to serve. Combine 1 cup fresh blueberries, 1 cup fresh sliced strawberries, 1 cup fresh raspberries, 1 seeded and finely chopped yellow bell pepper and 1 seeded and minced jalapeño chili in a medium bowl; toss gently. Add 2 tablespoons each of finely chopped red onion, finely chopped green onion and finely chopped cilantro; toss lightly. Combine 1 tablespoon each of cider vinegar, olive oil, freshly squeezed lime juice, orange juice and honey in a small bowl; mix well. Drizzle vinegar mixture over berry mixture; toss to coat. 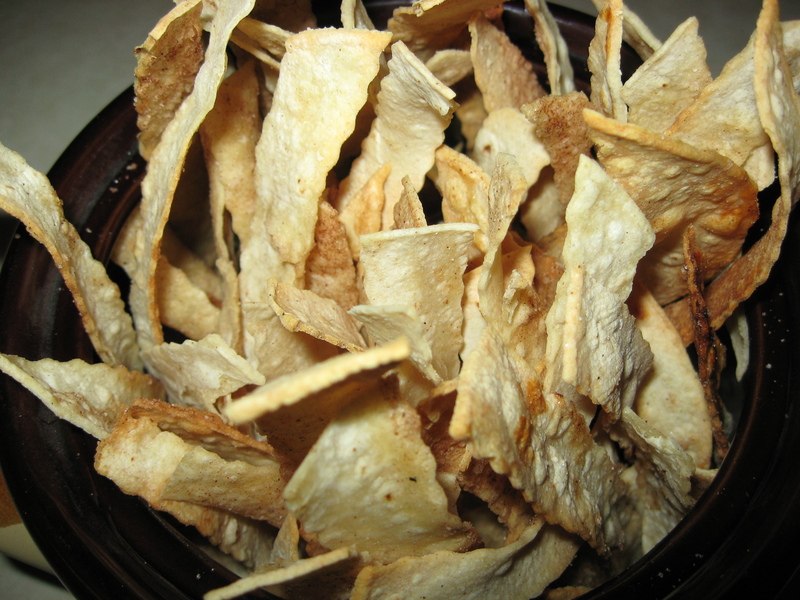 Serve in a large bowl or in individual bowls with the tortilla chips mentioned above. Makes 8- ½-cup servings.